Before you try to outrank your rivals, it’s important to learn what they’re doing with their webpages so you can aim to do it better. This tab of the On Page SEO Checker shows you an analysis of the top ten “rivals” on the first page for every keyword you requested ideas for. With each target keyword, your rivals will be analyzed in the following key areas: content length, # of referring domains, use of video, keyword usage, ordered lists, markups, and readability. Select the checkbox that says "Show keywords that trigger Featured Snippets first" to filter your ideas about acquiring a Featured Snippet at the top of the report. 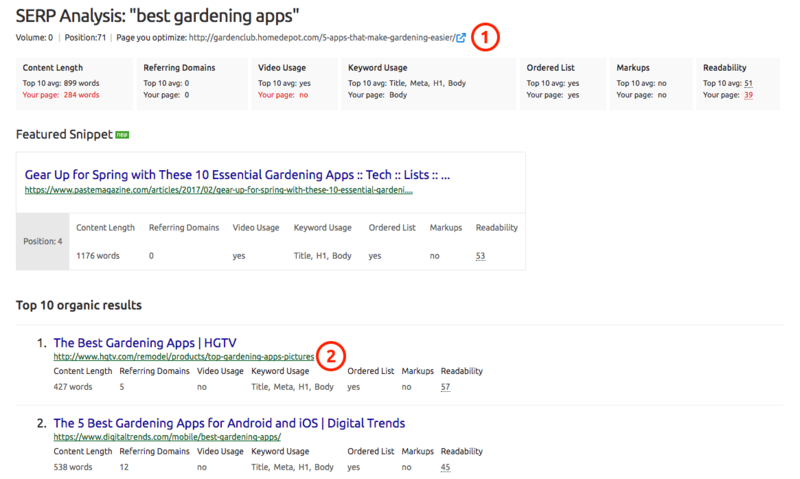 In addition to implementing these ideas, you can use Position Tracking to track your domain’s best Featured Snippet opportunities. If you see that your content length is way shorter than your rivals’ average, plan to expand the writing on your page to cover more topics and provide more information. Search engines prefer pages that have sufficient topical information to pages that are brief and fail to provide details. If you see that you have less referring domains than your rivals’ average, you will need to build links to your page from more referring domains to increase your page’s referral traffic and level of trust (more referring domains = more trust) to get ahead on the search results. For help building links, be sure to set up the Link Building Tool in your Project. This tells you if the web pages ranking in the top ten for a keyword feature an embedded video or not. If you are ranking within the top ten (position 6, for example), the tool will not take your page into consideration when deciding the average among the top ten. The use of video could show you how important videos are to your audience. If most rivals in the top 10 have videos on their pages and your page does not, then maybe you should consider adding one to improve the user experience. Using the target keyword in the title, header, body and meta info on your webpage are the simplest ways to strengthen its SEO. This is especially true if all of your rivals use the target keyword in their title and your page doesn’t. Do your rivals use an ordered list on their web pages to target a Featured Snippet? If so, maybe you should have a list on your page as well to compete. Lists give searchers and search engines an easy way to skim a page and find information. This is especially true if the keyword includes a modifier like “best ____,” “top ____,” or “____ ideas.” Lists are popular among \SERP Features, so it could be a good idea to include a list on your page if you want to improve its SEO. This will tell you if your rivals make use of Schema.org markups connected to getting Product reviews on their pages ranking ahead of you. These markups are good for SEO because they communicate to search engine bots about the nature of the information on the webpage, and searchers can see the quality of a product directly from the SERP. For more information, visit schema.org or read this blog post on Schema Markup. Your readability score will tell you if your content is more difficult to read than your competitors. With a higher readability score, a page is easier to read which can lead to longer time on page, potential conversions, and an overall better user experience. This analysis is only available for campaigns in English, Spanish, Italian, French, German & Dutch. Clicking the green “View full analysis” button takes you to a page with more details on the keyword’s SERP and quick metrics on each rival outranking you. If there is a Featured Snippet on the SERP, this will also be noted in the report. You’ll see the top ten search results for the keyword listed. Under each result will be the content length, referring domains, video usage, keyword usage, and readability of the rankings page. To see your page, click on the blue box with the arrow next to your URL (1). If you want to see a rival’s page, simply click the green link to their URL (2). These reports add value to a competitive analysis and can help when you’re creating your SEO plan. Why did I get a “page is not accessible” note for some of my pages? How do my On Page SEO Checker limits work?